An excellent training DVD that will enable you to dimensionally carve wood. This video shows you all the techniques needed to carve into the wood. We will carve an elk with a leaf border. 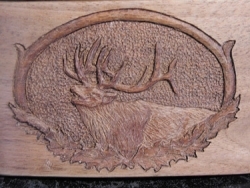 You will learn all the tips and tricks on stippling the background and carve the antlers with dimension. You will see the proper way to undercut to create depth.